Look in style with the USA Hockey Bomber. Decorated with the USA lettering in the front and Arc & Star logo in the back. Keep the wind away. Available in S-2XL. Snipe and Celly the competition with this retro style 5 panel hat your dad would have worn back in the 80's. Made from Performance poly fabric to keep the sweat away. One size fits most. Sun's out, gun's out with this classic USA Hockey tank top. Rep your favorite sport even on those hot summer days. Made of 100% pre-shrunk cotton. Comes in S-2XL. USA Hockey Joggers. 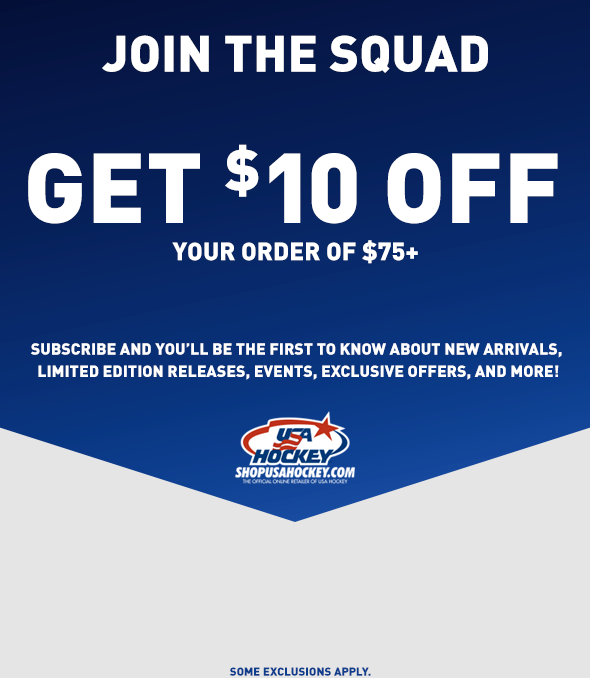 The perfect all-year staple to have in your USA Hockey wardrobe! A drawcord waist and pockets add the perfect combination of comfort and convenience. Modern fit, cotton/polyester blend and pill resistant. S-2XL. Bring back the 80's with this retro style hat. Made. One size fits most. Stars & Stripes never go out of style. Keep warm with this perfect USA Hockey beanie featuring the Arc & Star logo in the front and retro hockey mask with sticks in the back. Bundled with USA Hockey lanyard featuring a repeating raised imprint. Perfect for players, coaches and fans! Beanie size: Adult One Size. Lanyard Size: 35-1/2 ". Three is your new lucky number when you wear our Saint Hat Trick's tee. Made of 65% polyester 35% cotton, our tee is so soft you'll want to wear it for luck all year. Comes in S-2XL. USA Hockey® Mens Mesh Polo. No one ever said you couldn't be business casual and support your favorite hockey team at the same time! Show off your support at the office in this moisture wicking, snag resistant polo. 100% polyester with 3 button placket. Heat sealed logo. This product is not eligible for promotional offers or coupons.Remember the anticipation of the MIRACLE ON ICE® hockey game with this bib for your young one. This product is not eligible for promotional offers or coupons. Remember the anticipation of the MIRACLE ON ICE® hockey game with this strap-back cap. This product is not eligible for promotional offers or coupons.Remember the anticipation of the MIRACLE ON ICE® hockey game with awesome dog collar. Comes in S,M,L. 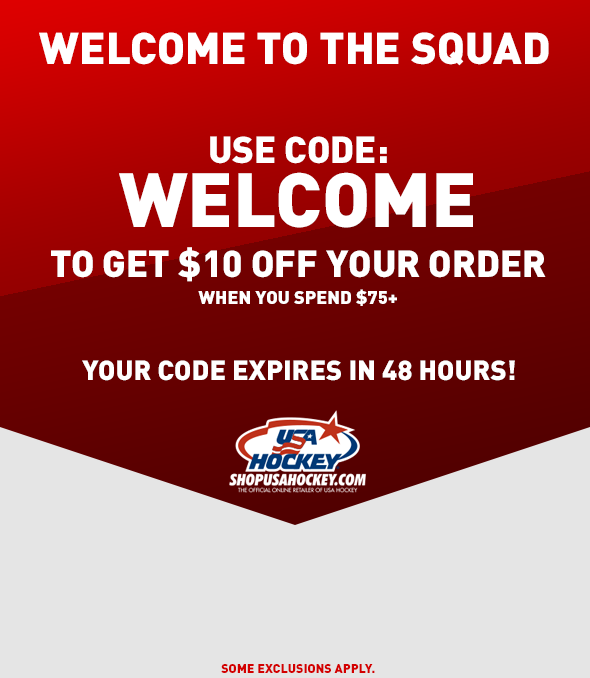 This product is not eligible for promotional offers or coupons.Remember the anticipation of the MIRACLE ON ICE® hockey game with awesome dog jersey. This product is not eligible for promotional offers or coupons.Remember the anticipation of the MIRACLE ON ICE® hockey game with this drawstring bag. This product is not eligible for promotional offers or coupons.Remember the anticipation of the MIRACLE ON ICE® hockey game with this flag.